FC65 in the Hyperflow of History. Covered in multimedia lecture #6974. The years when towns and trade were first reviving in Western Europe were precarious ones for the emerging middle class of merchants and artisans. Costly tolls levied by local nobles hampered trade when times were peaceful, while more turbulent times could see each of those nobles cutting off trade and marauding merchants on the road. Different weights, measures, and standards of coinage complicated transactions between merchants of neighboring towns. Famine could drive prices up dramatically, thus cutting down the flow of trade and causing turmoil among the workers who wanted higher wages to keep up with rising prices. Given such a dangerous world for the medieval merchants and artisans, it should come as no surprise that they formed associations, leagues and guilds, to protect and promote trade. These were not examples of free enterprise, however. Their purpose was to exclude outside competition from their markets since the evolving market economy was seen as too fragile to sustain much competition. In northern Europe, various towns would band together in leagues to establish collective security. The most important of these leagues was the Hanseatic League*, which was centered on the city of Lubeck in the southwest corner of the Baltic Sea. At the height of its power (c.1350 C.E.) the League contained over seventy German cities throughout the Baltic and North Seas. It kept an effective monopoly on the trade in this area by keeping out Russian, Scandinavian, and English competition. When pirates, local lords, or even kings threatened their trade or freedom, the League's forces could successfully defend their interests. The king of Denmark found this out to his dismay in 1370 when he tried to encroach on the League's territory and was driven back. The Hanseatic League dominated the trade of the Baltic and North Seas in the north much as the Italian cities dominated the Mediterranean trade in the south. Besides common military action, the Hanseatic League carried out other measures to protect and promote trade. For one thing, it established common weights, measures and coinage throughout its member cities. This cut down on the time-consuming hassles of having to convert from one weight and measurement system to another each time a new business transaction took place. Today we are in the final stages of this standardization process, as the metric system is being pushed for worldwide use. The Hanseatic League's success was also based on more advanced business techniques, in particular the use of credit. With a cash economy, a merchant could only buy as many goods as he had the cash on hand to pay with, which severely limited the scope of his activities. With credit that merchant could borrow more money than he actually had and use it to buy goods that he could sell for a larger profit than with a cash economy. This was because he was borrowing, buying, and reselling on a much larger scale (even after repaying the loan) than he ever could if he were dealing strictly with cash. As the merchant’s credit rating improved, he could borrow ever-larger sums of money, oftentimes in several places at a time through the use of his agents, which vastly expanded the scope of his activities, his profits, and his credit rating. Buying in larger volume also allowed him to sell each unit of goods more cheaply and thus undersell other merchants not dealing in credit. In such a way, the Hanseatic League established a virtual monopoly on trade in the Baltic and North Seas. The political expansion of the German people also helped the German cities of the Hanseatic League. At this time, German peasants and the crusading order of the Teutonic Knights were expanding into the interior of Eastern Europe against the Slavic peoples there. Meanwhile, the German cities founded colonies in their wake, thus increasing their economic power over the Baltic Sea and further restricting competition there. Although the Hanseatic League was the most important of the medieval town leagues, it was by no means the only one. There were several leagues of towns along the Rhine whose main concerns were to stop the raids of local nobles on trade and to curb the tolls those nobles imposed on goods passing through their territory. The most famous of these leagues, the Swabian League, had over eighty member cities at its height (late 1300's) and was strong enough to challenge the dukes of Austria and Bavaria. In Flanders, there was a league of twenty-two towns whose purpose was to buy raw wool from England. Another league of seventeen towns in Champagne County, France regulated marketing practices at trade fairs. Whatever their functions, the cumulative effect of leagues was to improve the trade and economy of Western Europe. And that in turn contributed to the rise of kings and more stability. served much the same function on a local level as leagues did on a wider geographic level: protecting their members from the dangers of outside world, whether they were marauding nobles and bandits, economic ruin, or outside competition. Originally each town would have one guild encompassing all crafts. However, as the towns grew, the guilds evolved into various specialized guilds: merchant, goldsmith, armorer, tailor, bargemen, etc. By 1200 C.E., Venice had fifty-eight guilds, Genoa thirty-three, Florence twenty-one, Cologne twenty-six, and Paris one hundred. The purpose of each guild was to exclude outsiders from practicing that guild's craft or trade within the city walls. Although this virtually eliminated free enterprise, it did provide a stable atmosphere in which the newly evolving crafts and trades could develop and survive. 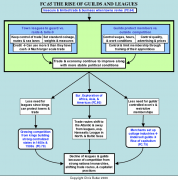 Guilds went much farther than excluding outside competition from within their walls. In fact they controlled just about every aspect of the town's economy, in particular wages, prices, quality of goods, and guild membership. For example, an armorer would buy the materials he needed through the guild at a set price, not on his own for whatever price was cheapest. His workers worked for the number of hours and wages set by the guild. His armor had to be of certain quality meeting the guild's specifications. He could not advertise beyond setting one example of his work in his window. The guild also determined the price he could charge so he would not get an advantage over other members of the guild. Set prices also reflected the Church's displeasure with profits. Training for and admission into the guild were also strictly regulated. Apprenticeship was almost always restricted to sons or nephews of guild masters, something that caused anger among the common laborers. Typically, a master craftsman would send his son to another craftsman for apprenticeship at the age of ten to twelve years. The boy would live in the master's home, work in his shop, and learn the craft in an apprenticeship lasting from three to fifteen years. At the end of his training, the apprentice would usually get a gift of money from the master to help him start his own business. He then became a journeyman who worked as a day laborer for different masters until he could save enough money to start his own shop. When he was ready, the journeyman would be examined by the guild masters for his technical ability, oftentimes having to produce a masterpiece to show his proficiency at the craft. If he passed the exam, and there was room in the guild, he became a master who shared in the limited, but fairly stable market established by the guild for its members. The guild was more than a business association. It was also a social and political organization that looked after the welfare of its members. It provided justice by settling disputes between its members. It supervised the morals of its members in such matters as public fighting, drunkenness, and a dress code. It provided insurance against fire, flood, theft, prison, and old age (for those few who survived that long). It paid for members' funerals and for masses and prayers to free their souls from Purgatory. The guilds would also build hospitals, almshouses, schools and orphanages for the many orphans in society back then. The guild was also a source of pride for its members. Each guild had its own guildhall where meetings and social functions were held. On the day celebrating its patron saint, a guild would put on parades and religious plays. Guilds would also dedicate to the town cathedral stained glass windows depicting biblical scenes that were also concerned with that guild's particular craft. Guilds, like leagues, caused Europe's economy and trade to improve, which made possible the rise of kings and more stable conditions. However, those very kings who profited from guilds and leagues were largely the cause of their decline in the 1400's. For one thing, the stable conditions protected by the kings made the guilds’ protective restrictions unnecessary. In spite of this, the guild masters who ran the towns restricted membership even more than before while maintaining strict price and quality controls on their goods. Earlier, such practices had been good since they had protected a fragile trade vulnerable to the harsh conditions of the time. By the late 1400's, those same practices that had once protected the guilds now worked to destroy them. Restrictive membership and low wages, even in time of inflation, led to worker revolts in many cities. Even more devastating was the competition from outside of town. Rich merchants started cottage industries where they moved production outside the city walls (and the guilds' jurisdiction). Here they could pay individual peasants lower wages to produce wool and undersell the guilds which were still locked into their controlled wage and price structure. As a result, guilds went into decline. The rise of strongly centralized states in the Later Middle Ages also hurt leagues, because the kings now protected trade and also saw the leagues as rivals for political power. At the same time, stability and trade fostered by the rise of kings sent explorers looking for new markets. The discovery of new trade routes to America and around Africa shifted trade away from the Baltic and North Seas, thus hurting the German leagues.